Donations Made to Charities as a Thank You for Attendance. 12:30-2:00 101 Neal Shore Road Meredith NH Broker Open House. Brokers may bring clients. (Luncheon and donation to cancer research by Liberty Title & Bank of New Hampshire's Tammy Cote). 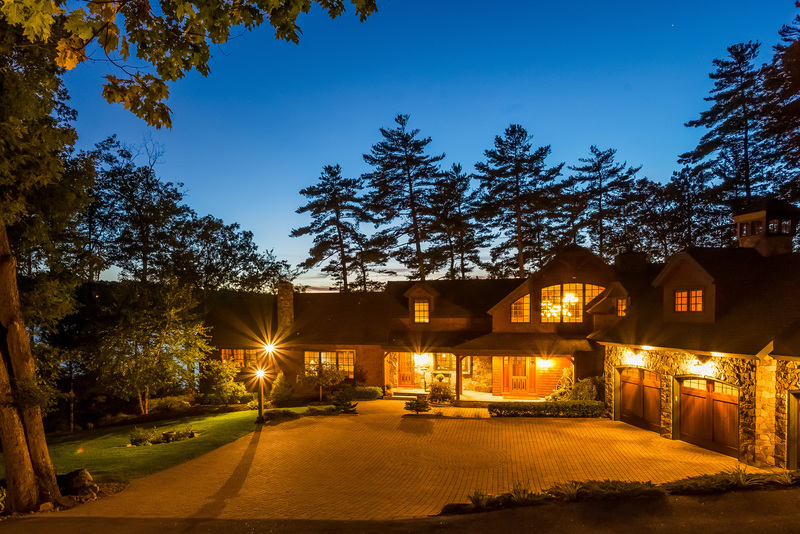 Spectacular custom home for sale on Lake Winnipesaukee, in coveted Meredith bay. The property comes with 2.2 acres of land, 163ft of pristine shore front and 4798 square ft of living space. The orientation is South West and the sun sets are extraordinary. Don't like covering your boat every night, no problem here .....just park your boat in the boat house! Enjoy the sugar sand beach and boat lift. There are 5 bedrooms and 5 bathrooms. 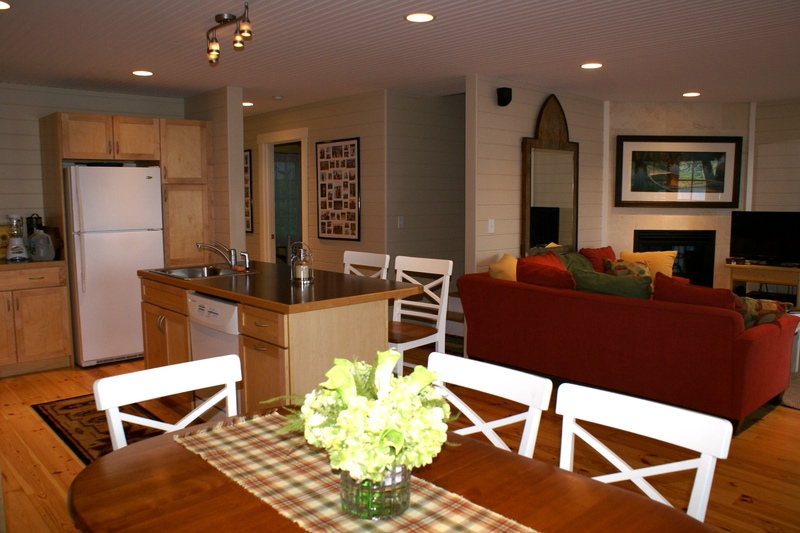 The open concept features a kitchen, dining room and a great room with beautiful lake views. 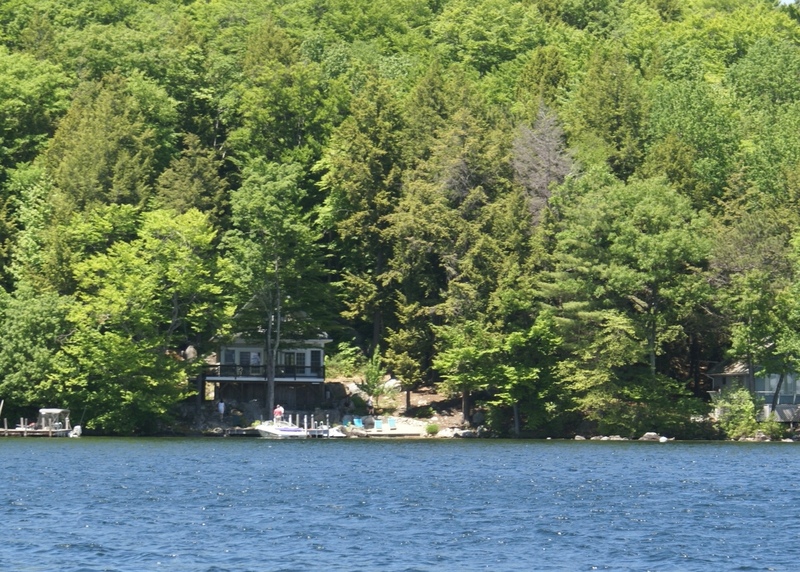 4:30-6:30 77 Ridge Road, Ashland Avaialble with a Dock to Access all of Squam Lake. STUNNING NEW construction. Magnificent views. Broker Open House. Brokers may bring clients. $892,000 for 77 Ridge Road, Ashland without a dock, $950,000 for 77 Ridge Road with a dock. For those who attend at least 101 Neal Shore Road, Meredith and 77 Ridge Road, Ashland, a $5.00 donation will be made in your name to the Lakes Region Children's Charity and your name will be entered to win a 2017 raffle to win an autographed New England Patriot's team member Charitable Foundation T-shirt. Contact Nicole Watkins for details. 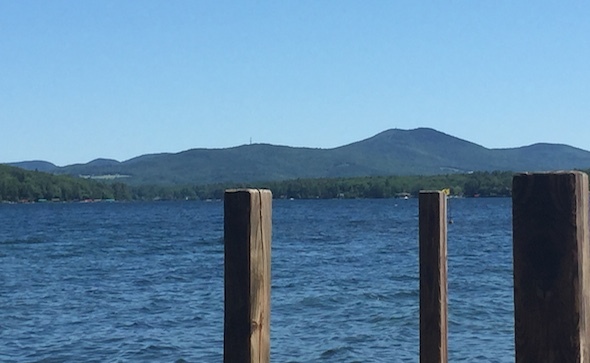 Enjoy Summer Days in Meredith NH by the Lake! Interior has fir beams and hardwood floors. 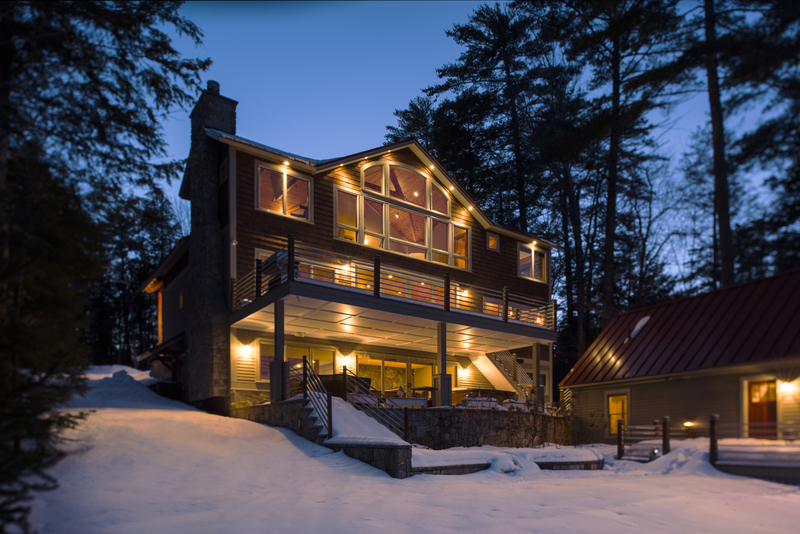 Immaculate and beautifully designed and built by a premier NH home builder. Just a few minutes to down town amenities by car or boat! Call Nicole Watkins for details. (603) 707-7575. 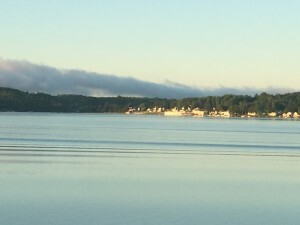 Early Morning View from this Spindle Point Winnipesaukee Meredith NH Rental. Ask about other homes by this builder and Winnipesaukee market conditions. Feel free to search sold Winnipesaukee homes to do your own market research before buying real estate. Call Nicole to ask about the sold Winnipesaukee homes for which she has represented buyers or sellers. What Secrets Does Windermere Hold? 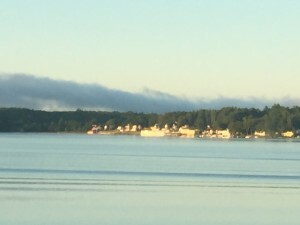 Windermere is a road poised at the end of Long Island. Windermere Estates is the last named and gated neighborhood on this bridged island, known as Long Island. 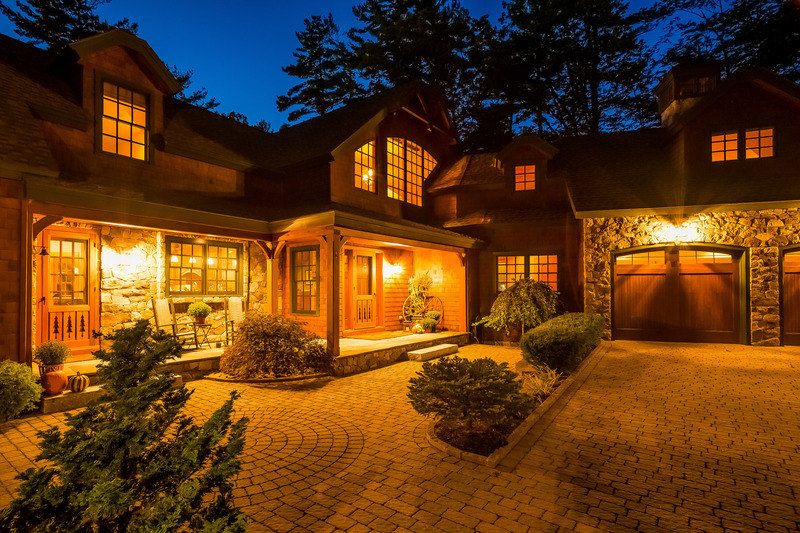 "Windermere Estates" leans against the widest part of Winnipesaukee. Dramatic lake and mountain views and serenity that comes from the surrounding woodlands and large expanse of lake. The geography of the land at the end Windermere Estates is the shape of a mouth open and calling across the lake. The name Windermere itself has the sound of a call or a beckon. And for very good reason. There is much about this part of the lake that is unique and wondrous. shows the proximity to the lake of the main home, allowing for spectacular views. 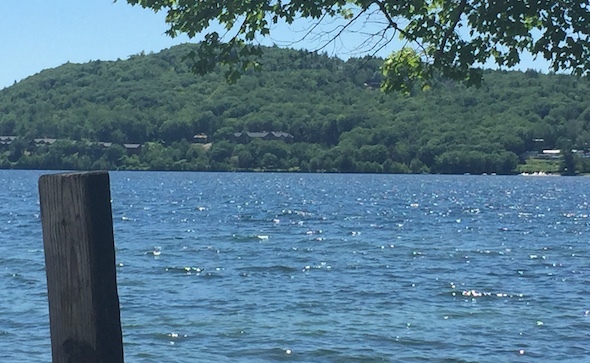 Rather than recount what I consider magnificent about this part of the lake, I invite those interested in viewing my 107 Windermere listing, to tour this part of the lake by boat with me. Why Not Experience Windermere for Yourself? Privacy and the Potential for Many Waterfront Amenities. 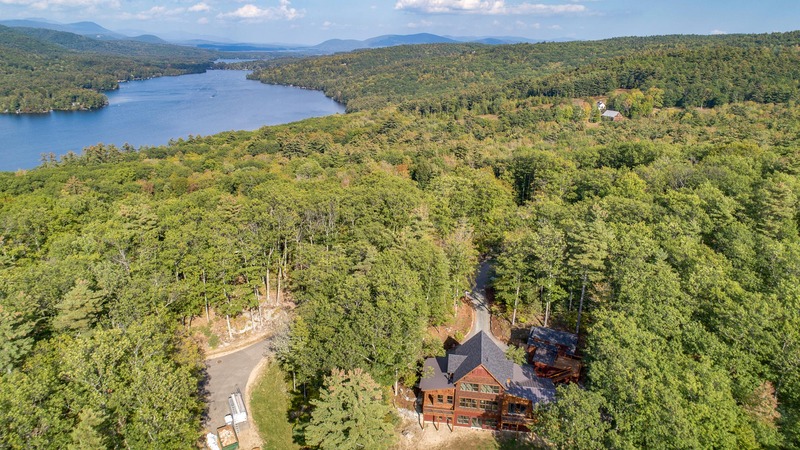 Not only does 107 Windermere Road, Moultonborough offer spectacular beauty in one of Winnipesaukee's most classic and peaceful lakefront neighborhoods, this waterfront property has been reduced to $1,000,000 this past week. You have to tour first hand this part of the lake to appreciate this value. The rectangular shaped parcel, 107 Windermere, is ideal. The waterfront is crystal clear and the angle of the shoreline gives you wonderful, pristine views in all directions. The roadside location of 107 Windermere is right across the street from a much larger parcel of land owned by Windermere Association. 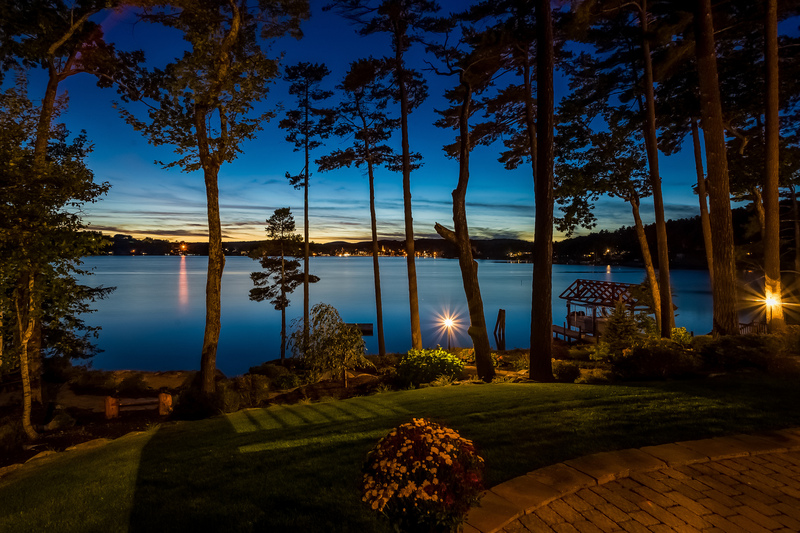 Privacy and quality resonate in every aspect of this New Hampshire lake location. 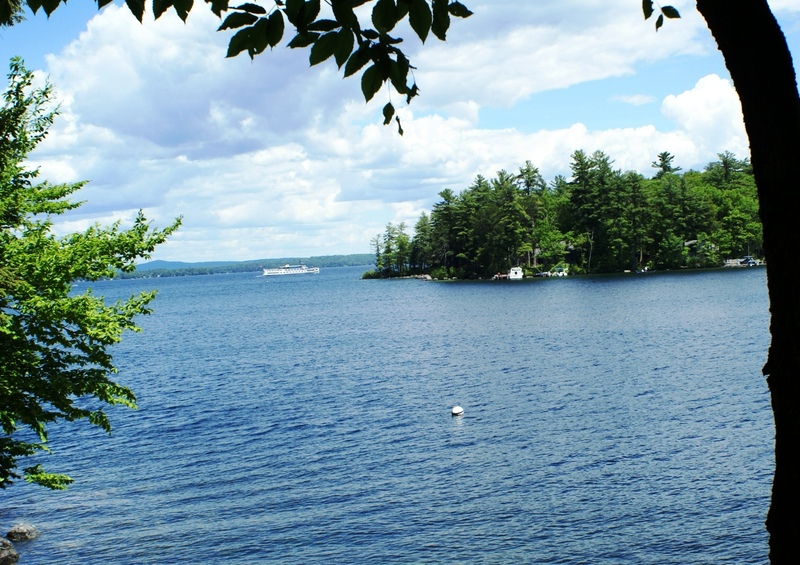 2.2 Acre Land Parcel has 300 Feet of Waterfront and "Grandfathered" Proximity to the Lake. This level, 2.2 acre lot has a long, sprawling 3 bedroom ranch home at water's edge. Experience the sight of long lake and mountain views from this lot and you'll understand the lure of Long Island and its environs. Rarely are such beautiful views right at your doorstep. 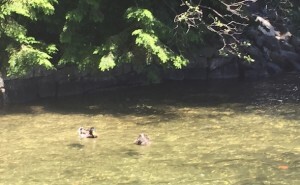 The sound of lapping water is just outside your windows. 3 Bedroom Home and 1 Bedroom Cottage are Currently on the Property. 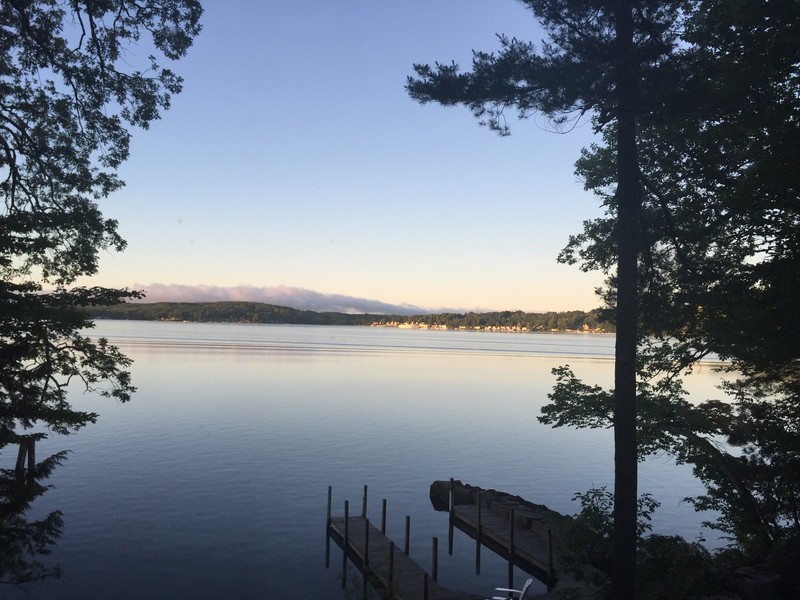 The 3 bedrooms, living room, large den, and kitchen all have Lake Winnipesaukee's shoreline a few feet...or even less...outside the window. Just a short ride on your jet ski can take you directly across the lake to Gilford NH amenities. Meredith and Center Harbor Bays are also just minutes away. Why deal with road traffic when a boat ride can take you where you want to go? Plenty of Room for an Extended Family to recreate at 107 Windermere Road. 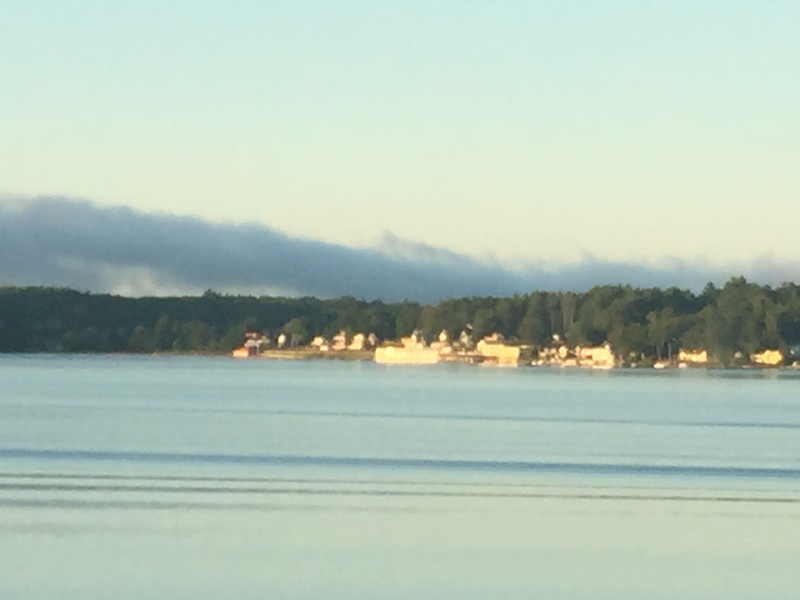 Enjoy views past Ragged Island all the way across the lake to Rattlesnake Island. This is an ideal land parcel for a new construction home. If privacy, central lake location, and end-of-Long-Island tranquility sound appealing, please call me to tour this property and this lake location. 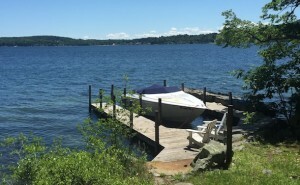 107 Windermere's 300 ft. of waterfront is plenty of room for perched beach, large docking system, fire pit etc., subject to state and local permits. 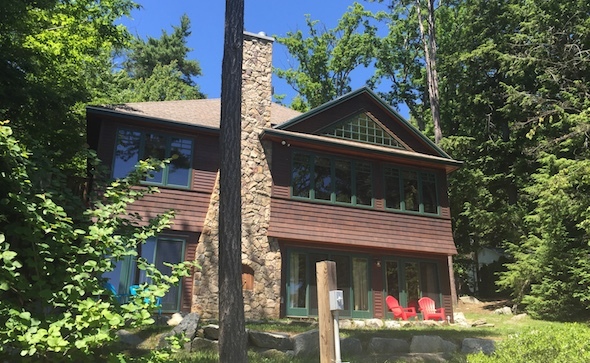 This property might have particular appeal to those who would value a large guest cottage as part of their Winnipesaukee lake home. 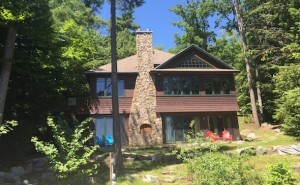 Although the current guest cottage needs to be rebuilt, a grandfathered full guest cottage with kitchen, screen porch, living room, and kitchen of this size is rare on a single lot of record in Moultonborough. 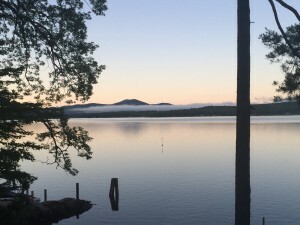 Please see the below link to view the listing sheet for this Moultonborough NH waterfront home for sale. 107 Windermere listing details page....Price just reduced! Contact Nicole Watkins, Exclusive Listing Agent, for details. 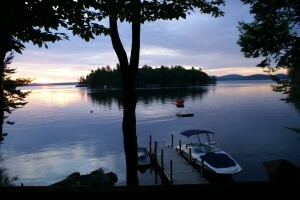 Or view all just listed Winnipesaukee real estate. Once-in-a-Lifetime Property with 20 Plus Acres and 740 feet of Winnipesaukee Waterfront along Norway Point. Winnipesaukee's Norway point is distinctive in all aspects. 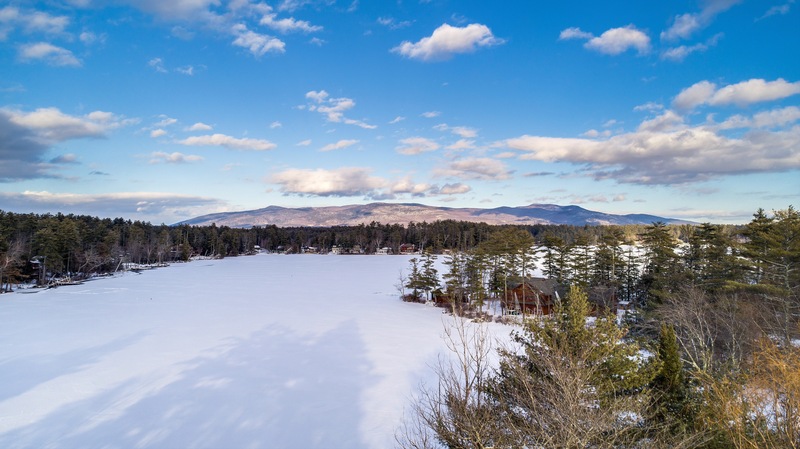 White sand shoreline, spectacular views, wide and long....hinting at the breadth of Winnipesaukee herself, while offering protection within the long arms of the cove. 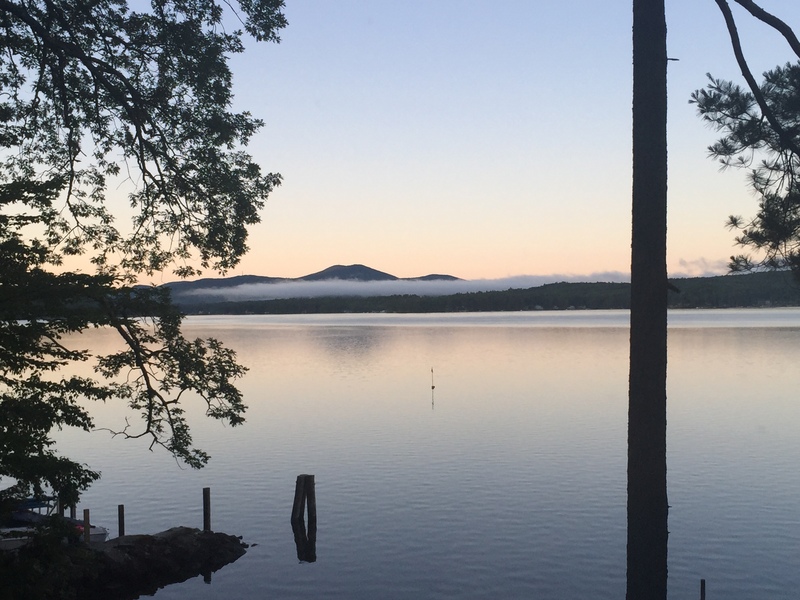 Moultonborough NH - This unprecedented Moultonborough Winnipesaukee offering has 2o plus acres and 740 feet of supremely private waterfront.The waterfront parcel has 12.229 acres and 740 feet of waterfront. No other homes can be seen from the existing cottage at 27 Norway Point or the natural sandy beach. 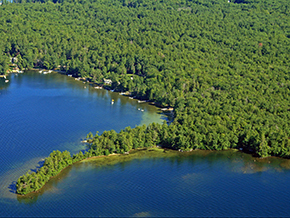 Forested shoreline along both sides of the cove is a restful vision for all those who dwell or visit this protected Winnipesaukee property. Rarely Are Views So All Encompassing Yet Seen from Such Protected Shoreline. 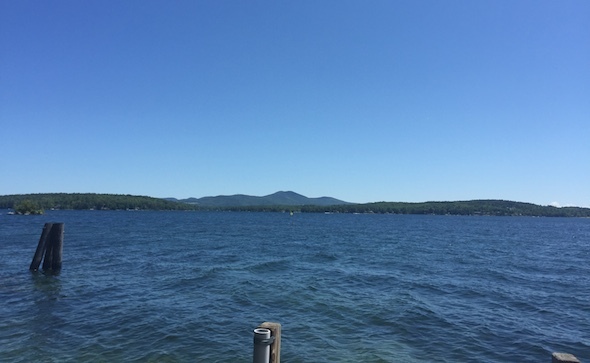 Expansive lake views extend across the Winnipesaukee's Gold Coast and across the entire lake. 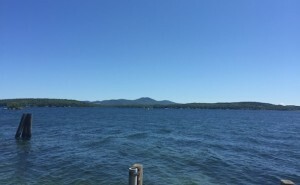 Lake and mountain views from this property include Long Island, Rattlesnake Island, Gunstock Mountain and the Belknaps. 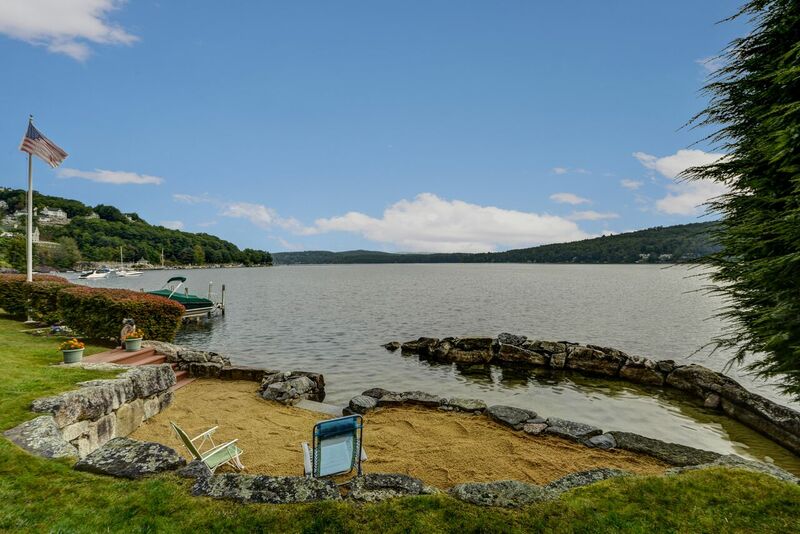 A natural sugar sand beach graces the shoreline at this 27 Norway Point estate parcel. Exceptional privacy is yours, yet the location is within a 10-15 minute car ride to Center Harbor NH gyms, restaurants, shops, and other amenities. 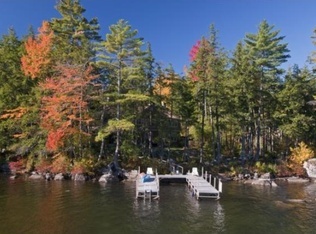 This NH waterfront estate parcel has just been subdivided from a larger 40 acre waterfront parcel. Limitations on further development of properties subdivided from the Norway Point Trust subdivision will keep this entire area private and serene. 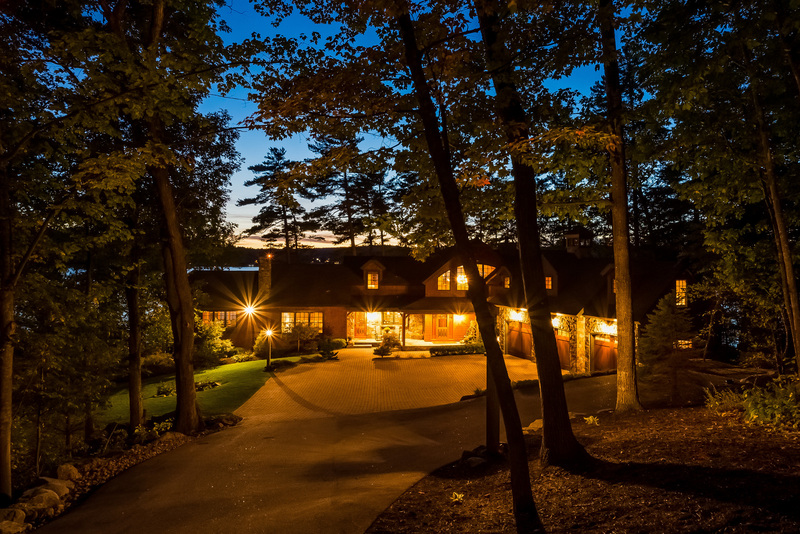 Those searching for one-of-a-kind properties should make an appointment to see this Winnipesaukee estate property this August 2014. Natural Sandy Beach, Southwest Exposure. Located Near Similarly Sized, Pristine Parcels. 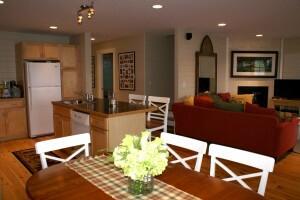 Sited near your natural sandy beach, the existing cottage has sought-after Southwest exposure. Crystal clear, sandy bottom water fills this cove and extends along the point. 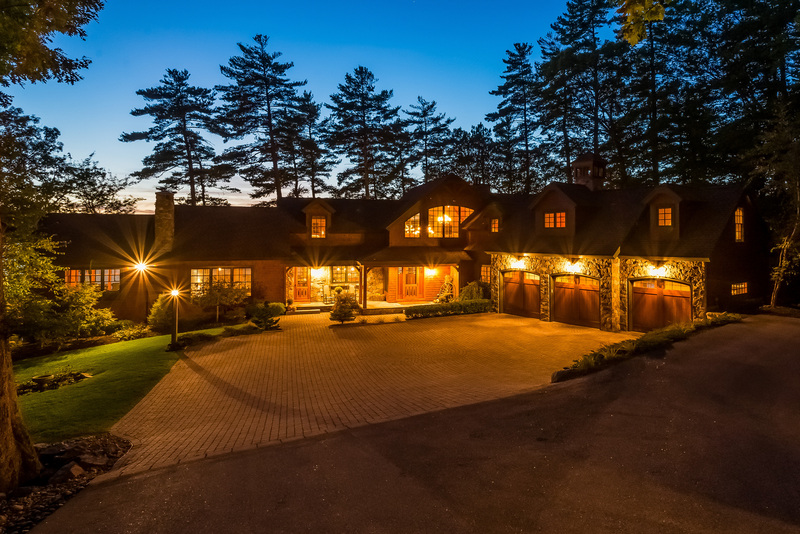 This NH estate offering includes 6 (six) lots of record. 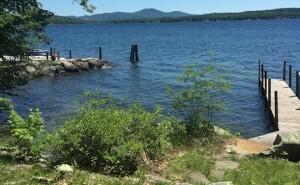 Five (5 ) land parcels are not on the water, but are within a short walking distance of the prime Winnipesaukee waterfront. This exceptional property in its entirety might be suitable for those who want a family compound for generations. 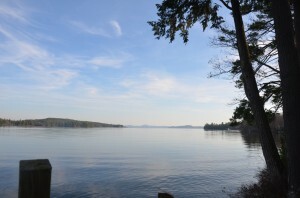 While only one home can be built directly on the waterfront, the extensive waterfront with magnificent views and rare, sandy bottom cove, would be ideal for a family to enjoy time together while enjoying the best nature has to offer. 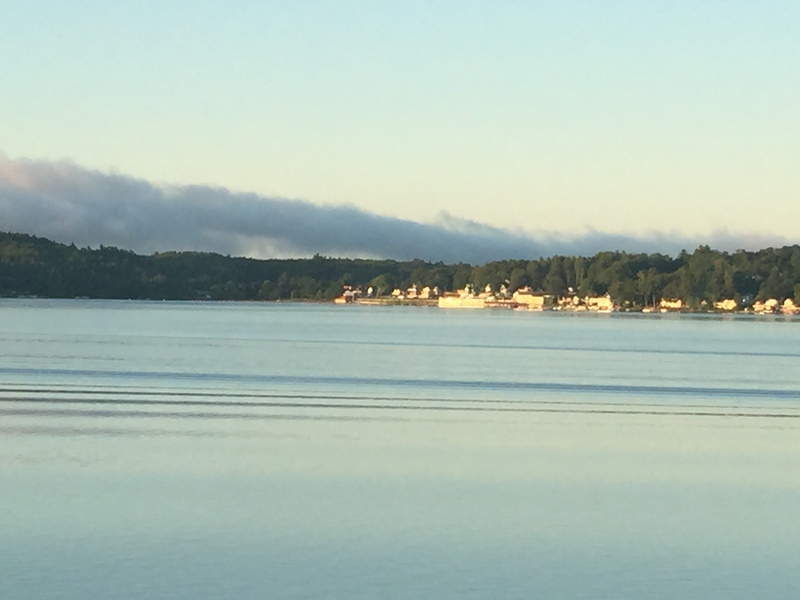 If you are looking for privacy, the quiet of a protected, very low boat-traffic area, and waterfront that glitters with beauty, look no further than Norway Point. 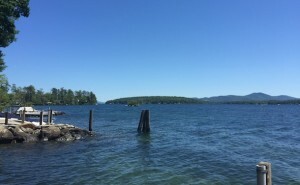 Whether you seek to keep the rustic cottage or build a luxury home, this waterfront land parcel offers all the elements for enjoying the best Lake Winnipesaukee has to offer you. 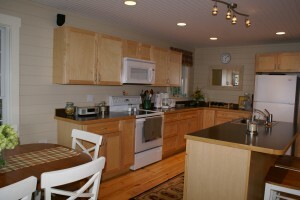 Visit the 27 Norway Point Listing details page for more information. 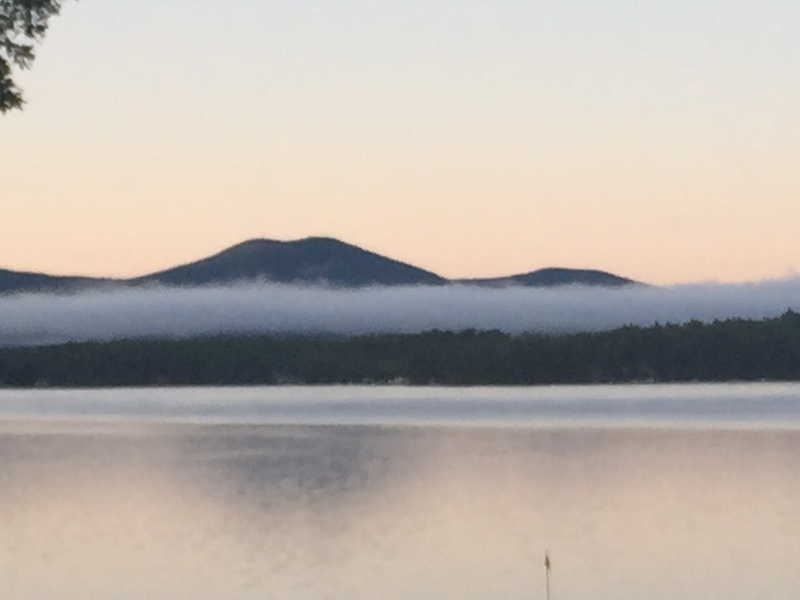 Search by NH Lakes Region town or lake. Contact Nicole Watkins, Exclusive Listing Agent for details or to make an appointment to tour this newly listed New Hampshire home. (603) 707-7575. 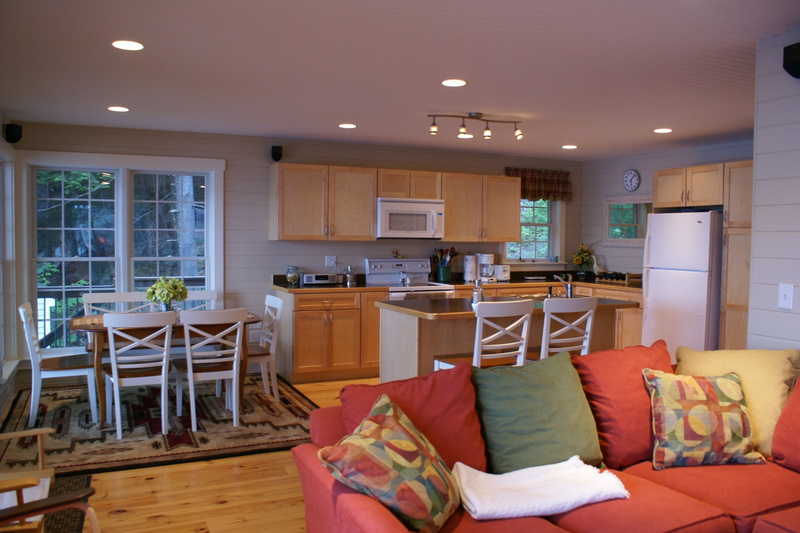 This Charming Sleepers Island Winnipesaukee Retreat has it all. 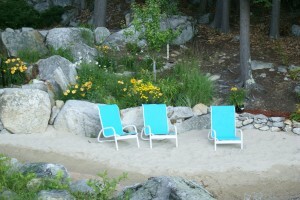 A sandy beach and crystal clear clear, sandy bottom waterfront make a great swimming area. Ever changing views of Treasure & beyond. 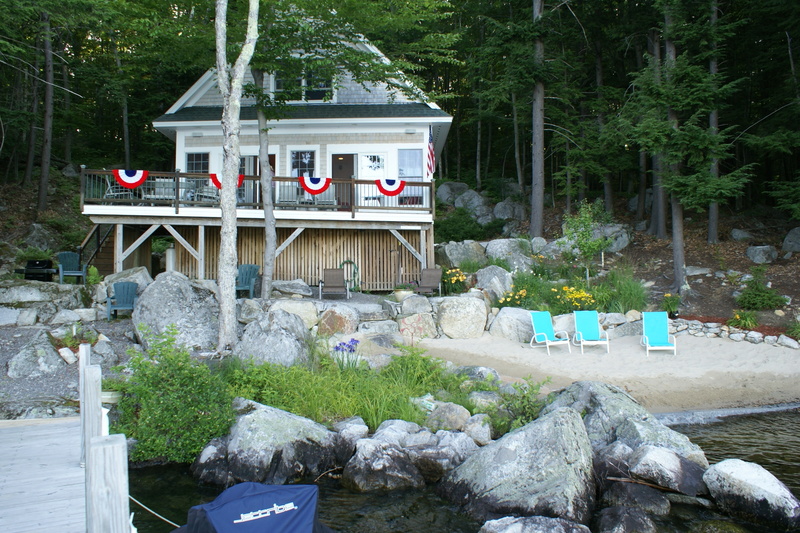 Winnipesaukee's 232 Sleepers Island is a gem of an Island property! 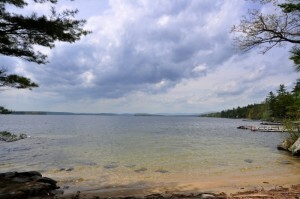 Level waterfront parcel has a perched sandy beach and sandy bottom, crystal clear waterfront. Desirable location is just a short boat ride to West Alton Marina and the main land. 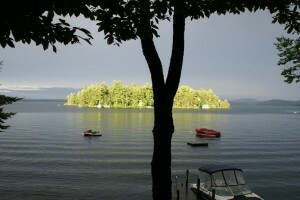 Newly listed Winnipesaukee island home. Call Nicole Watkins for more details at (603) 707-7575. Long Lake View but Quiet, Protected Location with Quality! Dramatic views....even the fireworks in Wolfeboro ...can be seen from your deck on the 4th of July! A trail of approximately 3/4 mile is a fun island hike. At 232 Sleeper, the Quality of Construction is a Rare Find. High Quality Construction Includes, Recessed Lighting, High Ceilings, Anderson Windows. Wooded surroundings around the mostly cleared lot provide a cooling affect on hot days. The Mystique of Sleepers Island appeal. Check back in a couple of days for more photos and information! Search My listings and My Firm's Listings. 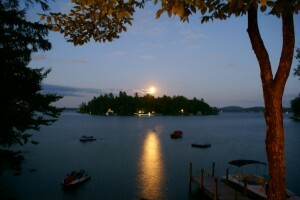 Search Just Listed Winnipesaukee Real Estate. 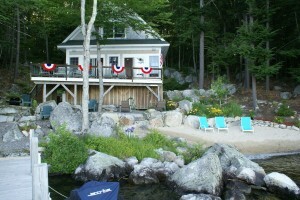 Ask Nicole about other Alton NH waterfront real estate. Moultonborough Winnipesaukee Property with 1.2 Acres and 200 Ft. Waterfront. 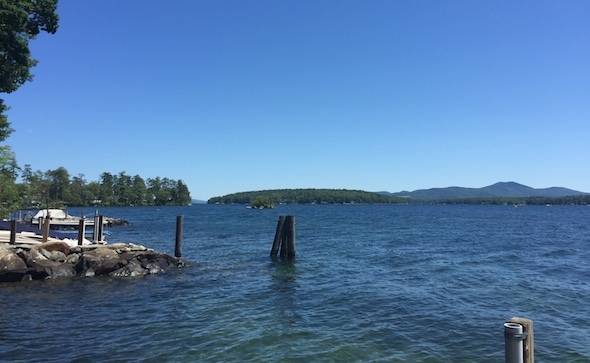 Centrally located on Winnipesaukee, the relaxed feeling of this waterfront parcel is apparent once you turn into the winding driveway. The long driveway winds through tall pines and manicured lawn. As you drive around the detached garag the lot gently slopes, affording wonderful privacy. 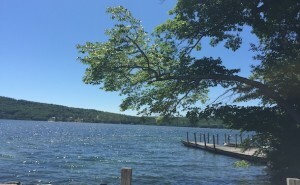 This 1.2 acre Winnipesaukee waterfront parcel has tall trees and ample lawn area for recreating and entertaining by the lake. 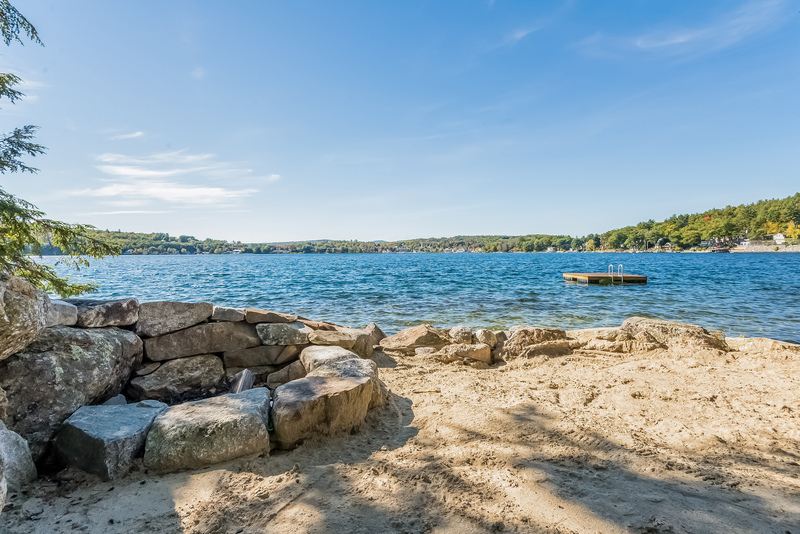 The expansive perched beach offers privacy, and lake and mountain views along your 200 feet of crystal clear, sandy bottom waterfront. 43 Leeward Shores Backyard has a Manicured Lawn Beneath the Towering Pines. The large backyard is both park-like and natural. The idyllic setting offers both shade and sun. 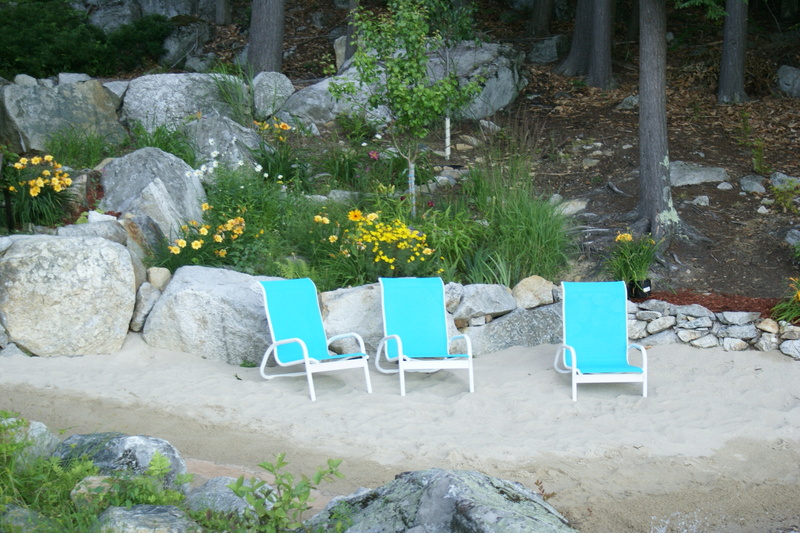 With plenty of room for volley ball, croquet, outdoor ping pong, or other games for active individuals, there is also a wide beach nestled into the shoreline for private relaxation. Picturesquely sited on this waterfront parcel, the log cabin is adorable. 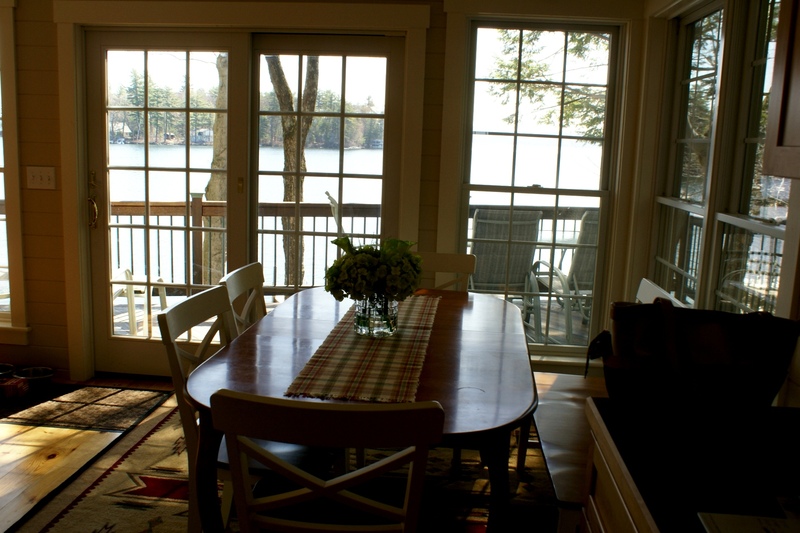 The screened porch offers big lake views and you'll feel wonderfully close to the lapping waves of Winnipesaukee. 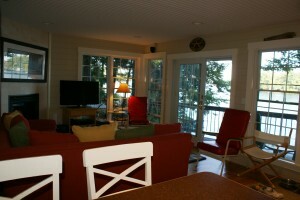 Quintessential porch is a perfect place to relax and listen to the loons. Watch the blue skies and clouds reflected in front of this Winnipesaukee parcel. Terraced just enough to provide fabulous privacy from the road, there is much to enjoy at 43 Leeward Shores. Home Buillders take note, there is potential for expanding the footprint of this home or building a new construction home, subject to NH state and town of Moultonborough approvals. Low tax town. the 4 bedroom septic system is approximately 8 years old; the drilled well is approximately 11 years old. U shaped dock. Bridged Long Island location. Click here to view this listing, 43 Leeward Shores Moultonborough, NH. 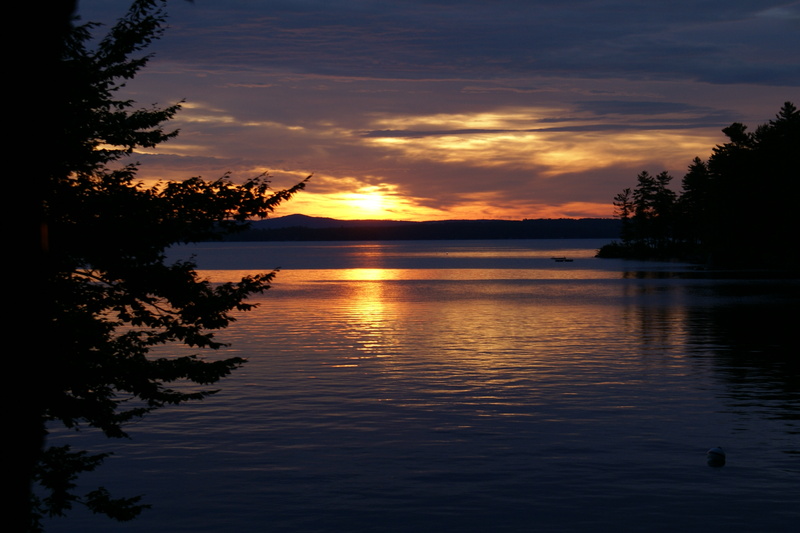 Click here to view all Moultonborough Winnipesaukee waterfront property. 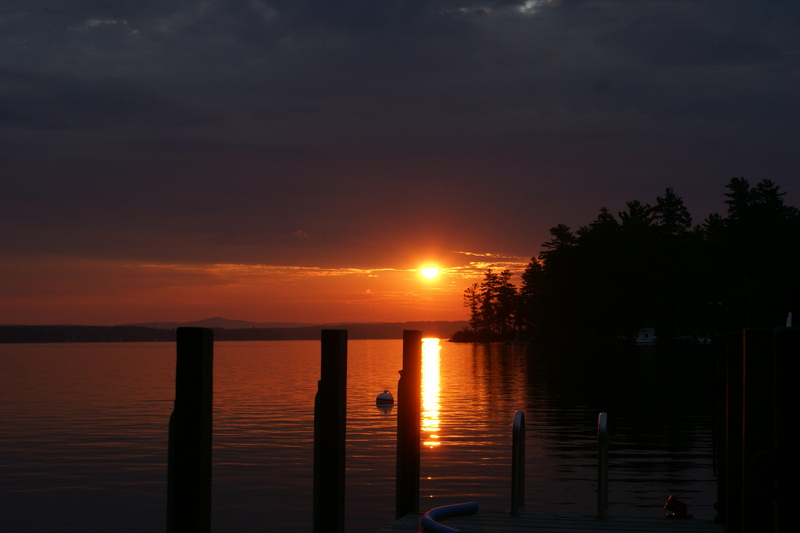 Click here to view all Winnipesaukee homes for sale with owned or shared water access. Sign up to save searches and be notified of price changes and new listings. 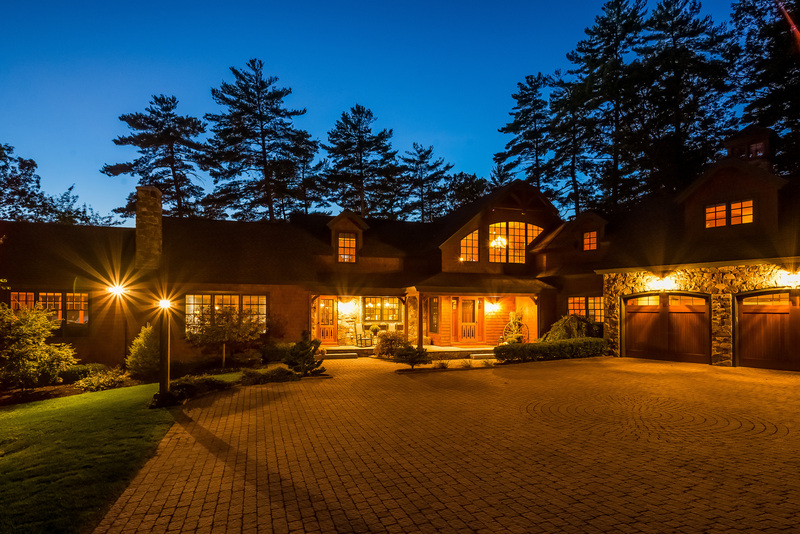 Search All Northern New England Real Estate Network MLS Listings.